Residence Inn by Marriott Orlando Airport is the perfect runway escape. 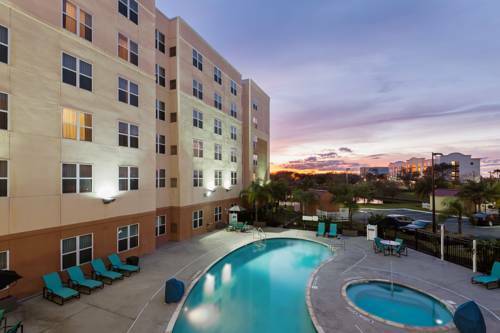 Our Orlando extended stay hotel is ideal for business and leisure travelers. We also are ideal for project teams, training, relocation, temporary housing, military housing, insurance housing and corporate housing in Orlando Florida. Located minutes away from the newly developing Lake Nona Medical City, our hotel near the Orlando airport offers free shuttle service to and from the airport, complimentary breakfast, outdoor swimming pool, fitness and business center, and free high speed wireless internet throughout the hotel and guestrooms. Balance work and life in our homelike surroundings while you take in the sights of Orlando including Kennedy Space Center, Walt Disney World, Universal Studios, or Sea World. Mingle with family and friends and enjoy complimentary wine and beer Monday-Wednesday from 5:30-7:30 at our evening social hour. Great location, first class amenities, and exceptional service. Thats the Residence Inn Orlando!